We've updated our list of the five best penny stocks this week. All five of the penny stocks on our list boasted double-digit gains last week, with the top-performing penny stock posting market-busting gains of 233%. This week, these stocks could rise even higher, which is why we're bringing them to your attention now. What's more, all of these stocks in our weekly list are only from reputable exchanges, like the Nasdaq or NYSEMKT. These exchanges have tougher financial reporting standards than penny stock exchanges like the Over-the-Counter Bulletin Board. We don't specifically recommend any of the penny stocks on our weekly list – that's for you to decide. 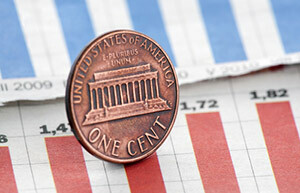 But we do have one bonus penny stock on our list this week that we highly recommend adding to your portfolio. Cobalt International Inc. is an oil and gas exploration and production company. Its main exploratory operations are in the U.S. Gulf of Mexico. CIE stock gained 38% last week after investors caught wind of insider buying. The company's CEO and CFO both bought 100,000 shares of stock. For penny stock investors, insider buying is a highly bullish indicator. CIE stock is currently trading at $1.30 per share as of Monday intraday and is down 75% year to date. Lpath is a biotech company that discovers and develops lipidomic-based antibodies. The company works in a burgeoning field of medical science that uses lipids to treat a wide range of human diseases. It has three drug candidates, and all of them are in clinical trials. LPTN stock gained 73% last week, but there appears to be no catalyst behind its rise. This usually suggests general investor speculation – something common with penny stocks. LPTN stock is currently trading at $2.91 per share as of Monday intraday and is down 5% YTD. Liking some of the penny stocks on our list? Check out the three best strategies for trading penny stocks before you consider buying anything. Marrone Bio develops bio-based pest management solutions and plant health products. It caters to the agriculture and waste treatment industries. MBII stock gained 74% last week after the company's recent earnings report citied improving financial results and a new partnership with Albaugh LLC, an Iowa-based agrochemical maker. MBII stock is currently trading at $1.60 per share as of Monday intraday and is up 44% YTD. ERBA Diagnostics develops test kits and diagnostic instruments in the fields of autoimmune, diabetes, infectious diseases, and hematology. It operates in the United States, Latin America, and Italy. ERB stock gained 48% last week, but there was no apparent reason behind its rise. ERBA stock is trading at $0.84 per share as of Monday intraday and is down 75% YTD. Continue reading to get the No. 1 pick in our best penny stocks this week list. StemCells researches and develops stem cell therapeutics. Its lead product, which is in clinical development, aims to treat a wide range of central nervous system diseases and disorders. STEM stock gained 235% last week after it announced a merger with Microbot Medical, a private company. After the merger, StemCells plans to develop robotics-based medical devices for the treatment of spinal fluid and gastrointestinal disorders. STEM stock is currently trading at $1.75 per share as of Monday intraday and is down 64% YTD. If you like penny stocks, you'll love this emerging industry that's projected to grow by $30 billion in 2020, according to the Bank of America Merrill Lynch. There are over 80 penny stocks in this industry that could soar in the three-and-a-half years.